Make registration, ticketing, and payments look easy. CampusRight is the out-of-this-world platform used by colleges and universities across North America to deliver a seamless experience for administrators and students. Alleviate stress on departments across campus. CampusRight helps you deliver high-quality events with a fraction of the effort (and cost). Eliminate paperwork and stay organized with an event ticketing system and hands-off payment process that allows you to focus on executing your event. Empower attendees to order tickets online and select seats with our seatmap, all while making it easier for you to manage invitees, seating, and more. Share information quickly, easily, and securely across campus with automated notifications and workflow approvals that integrate with your SIS. Simplify the planning of an event on top of your regular workload. Like a personal assistant, CampusRight streamlines your workflows and makes it easy to build custom drag-and-drop registration forms and collect payments. You also gain access to data that helps boost engagement and participation—all with little to no training or IT involvement. Reduce risk and errors: Go paperless. Invitations, RSVPs, payment collection, seating requests, student name pronunciation, meal preferences, ticket distribution —automate these tasks all from one easy-to-use platform. You can manage every detail of event planning online, in real time, allowing you to spend more time on your event and less time on the minutia. Empower event attendees with anytime, anywhere access. Making your guests’ lives easier makes your life easier, too. Give event attendees the convenience of mobile-friendly forms that they can access 24/7, eliminating the need for you to extend hours for in-person purchases. Guests can print their personalized tickets or use their phones, and you can too with mobile and bar code ticket scanning. You can also automate email and text reminders to increase responses and allow guests to choose seating (goodbye, chaotic sticky-note seating chart!). Integrate secure credit and debit card payments with your accounting software. Remain completely hands-off during the payment process while having access to real-time payment and registration details. Online credit card acceptance and receipting eliminates the paperwork and risks associated with cash. Credit card data is safely stored and you have a fully auditable trail. CampusRight combines our compliance leadership and management experience with tech savvy to bring you a platform that takes administrative tasks off your plate. Use CampusRight without installing any software. Our web app makes it easy for you to customize and manage events while giving your donors and supporters 24/7 access. Integrate with tools you already use. Pull data from your student information system (SIS), push information into your accounting system (GL), or share information with your donor management software. 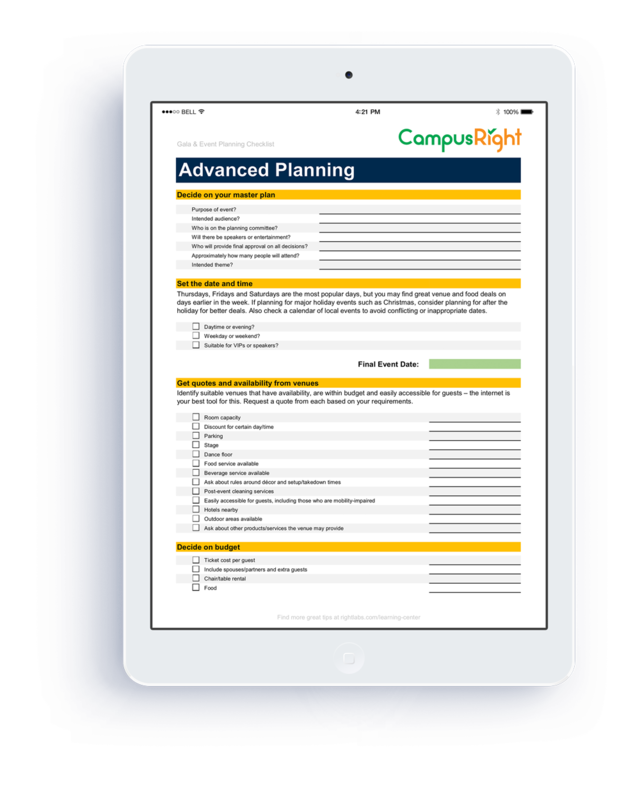 Quickly implement the cloud-based CampusRight, and adapt it to meet your goals as they evolve. Customize fields and forms so they always fit your institution, event, and audience. Receive the support you need, when you need it. Our team works hand in hand with institutions to continue developing solutions that meet your dynamic needs. Planning a holiday party, fundraising gala, or alumni dinner? Create a memorable event with minimal stress using our ultimate checklist that captures all those easy-to-miss details. With this list, you can track tasks for planning, the week before, the day before, the day of, and the day following the event—all in one document. Reduce the time it takes to pull off the perfect event. Receive our experts' latest insights on student and alumni engagement, cross-campus collaboration, and more.